Some days, it’s a scared-looking child who needs a textbook, a desk, and perhaps a kind word. Other days, it’s a familiar face that’s no longer there — a beloved student who has left without saying goodbye. This is life for teachers who work in schools across Detroit, where a majority of students — nearly 60 percent, according to a recent analysis — were enrolled in two or more schools during a recent school year, many jumping from one school to another, and sometimes back again. All that movement has serious consequences for kids, including significantly lower test scores and higher dropout rates, research shows. For their teachers, it’s a recipe for heartbreak. “It’s devastating,” said Takeleh Eaton, a first-grade teacher at Bethune Elementary-MIddle School on Detroit’s northwest side, where school officials say they see students coming and going nearly every week. Parents of most of the children who leave don’t notify the school, so their teachers are left to wonder how they’re doing. The next day or the following week, Eaton said, another child might arrive in her classroom. And that takes a different kind of toll — the kind that can throw off the culture a teacher works hard to establish. Kaira Gandy, who taught seventh- and eighth-grade English at Bethune last year, said it takes her two weeks to get to know a new student. And that work to understand a student’s needs and abilities often takes place while trying to handle disruption that the new student creates. Teachers say they wish they had a better way to learn about new students when they arrive. 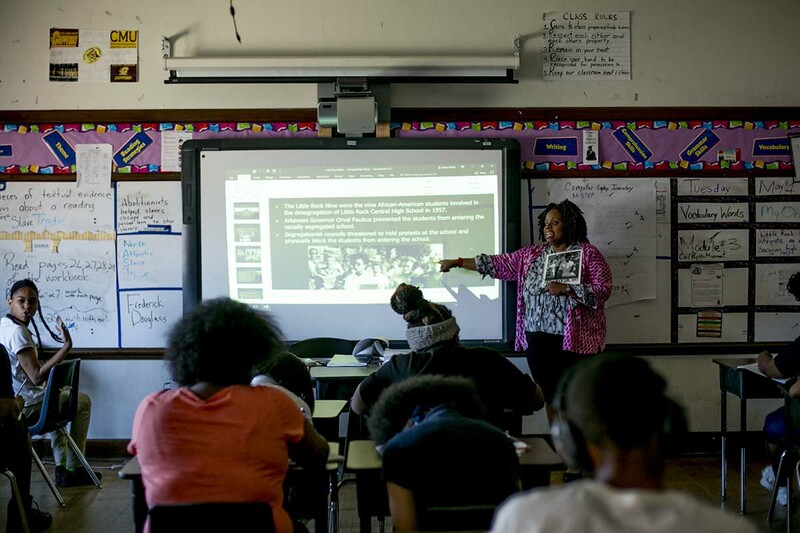 Lydia Nickleberry, a second-grade teacher at Bethune, faced a far different situation at a previous teaching job a couple years ago at Chandler Park Academy, a charter school in Harper Woods. Students largely returned every year, Nickleberry said, and it was easy to get information about students from their previous teachers. But much of the time, she said, the tracker sheet doesn’t get used because the child changes schools. Nickleberry said Detroit schools — district schools, charter schools, suburban schools — should work together to develop a system to transmit that kind of information no matter where a child lands. That would help teachers stay on track when a student arrives. And it might reduce some of the distress for teachers and staff who build relationships with children, only to see them go.